GNM Course 2018: Diploma in General nursing and Midwifery or GNM Course is a diploma course in Paramedics having duration of 03 to 04 years. In this course the main focus laid on care to individuals, families, and communities. Steel Authority of India Limited (SAIL), BOKARO has released 40 seats of GNM Nursing Course which is to be filled by 10+2 Female Candidates. Applicants can fill GNM Nursing Application Form 2018 on or before the last date that is 15-09-2018. It is mandatory for candidates to satisfy eligibility norms to apply for GNM Nursing Admission 2018. Interested unmarried female candidates who are physically and mentally fit after qualifying 10+2 in Science are eligible to apply. It is important for candidates to be physically and mentally fit. 10+2 passed in Science (preferably PCB) & English in regular course with aggregate of 40% marks is the minimum qualification required to fill GNM Nursing Application Form. Age of the applying candidate must be from 17 to 23 years as on 31-12-2018. Rs. Rs. 500/- as examination fee using online mode through SBI Collect has to be paid by the candidate who are going to apply for GNM Nursing course. Candidates will first get shortlisted through screening of application forms. After that those shortlisted candidates will be called for further selection procedure that is entrance examination (Aptitude Test) which is scheduled on 29-09-2018. Those who qualify entrance examination (Aptitude Test) then will be called for further selection process. Candidates willing to build upa successful career in medical field can apply for the GNM Course or ANM Course just after completing their 10+2. There are many colleges that provide this course on part time basis also. To attain further details about GNM Course 2018-2019 candidates can go through the below section of this page created by team members of privatejobshub.in. health care, nursing, and midwifery. treatment of children, women & old age people. After completing 10+2 candidates can apply for Admission in GNM Course and ANM Course. Many colleges conduct entrance examinations to give candidates admission to the following course. On the other hand many colleges providedirect admission to candidates on the basis of marks secured by them in 10+2. Here we are providing a list of colleges offer AGNM Course and ANM Course. After the successfully completion of the ANM & GNM course, there are a various higher study options as well as career scope for you. After completing the GNM or ANM course candidates can get jobs in Government as well as Private Hospitals easily. Mostly they work in areas like government and private hospitals, nursing homes, old age homes, orphanages, various industries, sanatoriums and armed forces. Not only in Medical field candidates can also work in education Institutions, nursing tutor, ICU nurse & Infection control nurse. After completion of course candidates get registered for State Nurse Registration Council. Those candidates who complete the ANM degree can also get admission in GNM (General Nursing and Midwifery) course. After completion of ANM degree candidates can opt career as Community Health Worker, Home Nurse, Health Visitor, Basic Health Worker & Rural Health Worker. Not only in India but in abroad also, there is a high demand of candidates who pursue GNM Course and ANM Course. Evaluate the nursing need of clients. Communicate about the clients requirements. Monitor the condition of patients. Set up medical equipment in operation theatres. 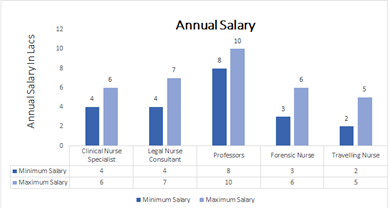 Salary of Nurses usually based on the experience they have. Further the salary factor also depends upon working area, education, experience, location, job profile, etc. Dear candidates if you have any query regarding the details given here on this page then you may mention your comments in below given comment box. To get more related updates candidates can visit our other pages too.